stretch. sound. heal. is a Yoga and Sound Bath Practice put together by Basu Iya Aswad and Holistic Practitioner Sunshyne Purnell. It focuses on total relaxation, stress relief, mindfulness and a healing journey that relaxes the mind and activates the body’s natural energetic healing system. SAY Yoga™ (created by Sunshyne... must be 18 or over). We will incorporate, healing sounds, energetic flushes, affirmations, crystal singing bowls, meditation and other healing tools to transform the nervous system. When you sign up for this class we encourage healing our brains and bodies, relieving stress and stagnant energy blocks . It is to expand your consciousness and provide healing, peace of mind, and self-discovery. Everyone is welcomed. Bring an open heart and positive intentions to create a comfortable space for healing vibrations. Bring your friends and family. Come recalibrate your unique vibration and open yourself to the gift of positive change. ​You MUST RSVP! Text 678-824-5025 with your First and Last name. ​Children are welcome as long as they can sit and meditate without disturbing the process. ​NOTE: We will have Adult ONLY classes from time to time. 1. Your practice deepens more quickly. 2. You meditate for a longer period of time than when alone. 3. You experience uplifting, inspiring group energy. 4. You feel connection with others. 5. You are with those who share your spiritual interests and journey. 6. You support one another. 7. You are more consistent. 8. You will make new, spiritual, friends. 9. You commitment becomes stronger. To attend stretch. sound. heal. 1. Exact Cash Day of. ​You MUST RSVP! Text 678-824-5025 with your First and Last name of all in your party. Also see form below. 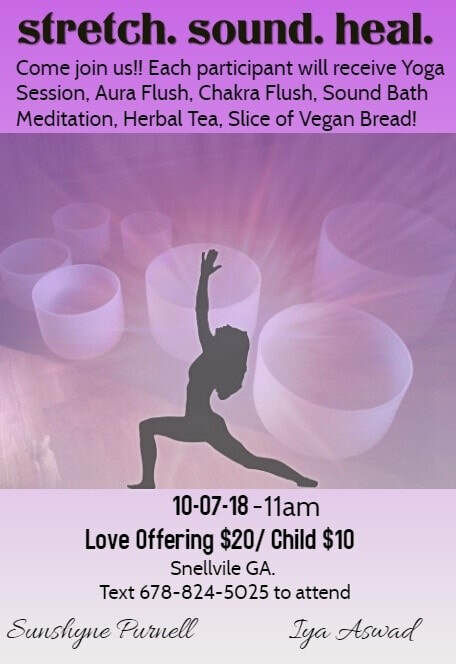 Share a cup of Herbal Tea and a slice of Vegan bread by Loaves of Love by sunshyne. Yes. Please contact me to explain more.